On Friday, 31 March 2017, the New York Staff Band (Bandmaster Derek Lance) headed to Columbus, Ohio, to take part in this year’s God and Country Concert held at the Church at Mill Run, in conjunction with the Brass Band of Columbus (Musical Director Brian Stevens). The last time that the Staff Band was the guest band for this event was in 2011. The God and Country concert series was established in 1986 to foster friendship, cooperation, and musical fellowship between musicians of the Salvation Army and musicians of the greater Columbus area, specifically the Brass Band of Columbus. In addition, the purposes of the event are to honor God and Country through music, to recognize outstanding contributions to and through music, and to assist youth with their musical development. The Staff Band’s travel plans did not work out as planned – there were many delays on the way to Columbus, even leading some members to drive the entire way from JFK Airport overnight to make it to city. On Saturday, 1 April 2017, the members of the Staff Band were able to relax a bit in the morning and have a leisurely breakfast. Because of the uncertainty of the flights the previous night, the planned Saturday afternoon concert was cancelled. After lunch, the Staff Band headed to the church to have a quick sound check and massed band rehearsal with the Brass Band of Columbus. Once again this year, the event was sponsored by All-Star Brass (Founder/Director Dr. Eric Aho). The program was a mix of old and new, featuring a world premiere of a new piece by Dorothy Gates, Holy Ground. The major works from the Staff Band were The Present Age (Leslie Condon) and I Surrender (Marcus Venables). The house was packed and the audience was receptive to what both bands had to offer. The Staff Band was on duty for Sunday morning worship at the Salvation Army Chapel at Worthington Woods Corps. The service featured the commissioning of Bandmaster Eric Snowden, led by the Staff Band’s Executive Officer, Lt.-Colonel James LaBossiere. It was a wonderful time of worship followed by a delicious lunch. 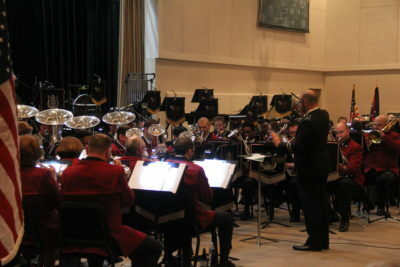 This article was posted in News and tagged All-Star Brass Band, Brass Band of Columbus, Brian Stevens, Brindley Venables, concert, Derek Lance, Dorothy Gates, Eric Aho, Eric Snowden, James LaBossiere, ministry weekend, New York Staff Band, Ryan McCrudden, special event on 28 May 2017 .